20110225 - Up and at the desk all day long. Things not so fantastic work-wise, even for the short week it was... L home not feeling well. I took all the boys out to get movies and dinner. Home, ate, watched 'Mastermind'. All to bed pretty early. 20110224 - Up very busy day at work, strange things going on... G had soccer today after school. 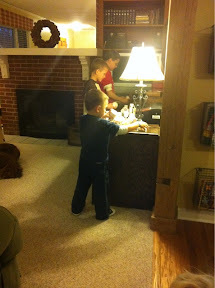 D sent to his room, missed dinner... Dinner then G&I went out and registered D for spring baseball, got gas and candy. Home played UNO attack with LJ&G. D still in his room... Watched 'American Idol' and 'Grays Anatomy'. 20110223 + back to work :-( stressful day, late calls. Boys home, nice dinner. D to basketball, JG&I played chess and checkers and watched 'American Idol'.